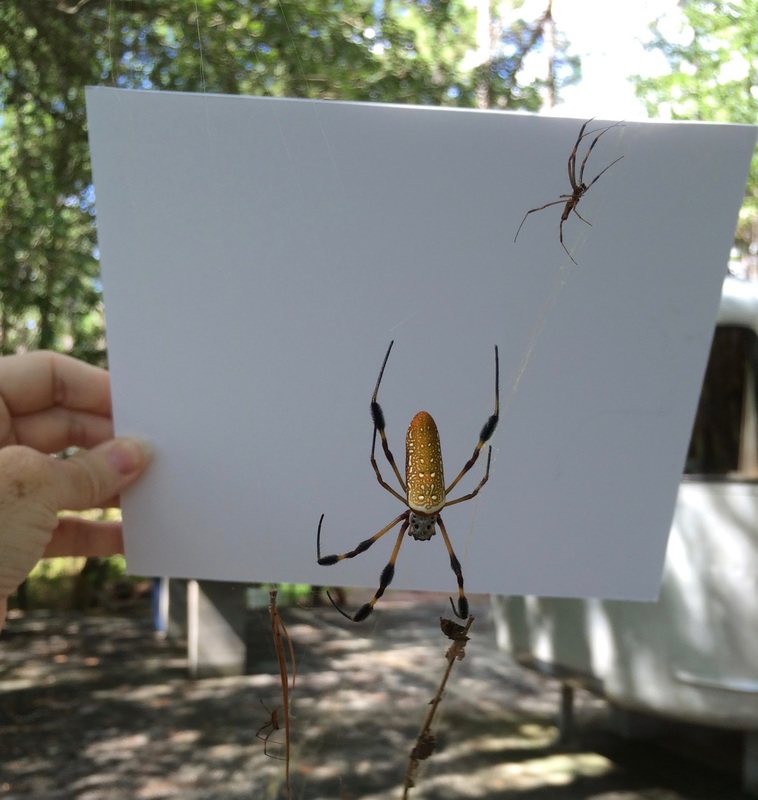 A Golden Orb Weaver spider set up house right outside my knitting lab. When I saw her there with her two diminutive male companions suspended in mid air, a nearly invisible web of golden threads connecting between a tree and the ground I thought, "Oooo! I wonder if I can knit with that?" 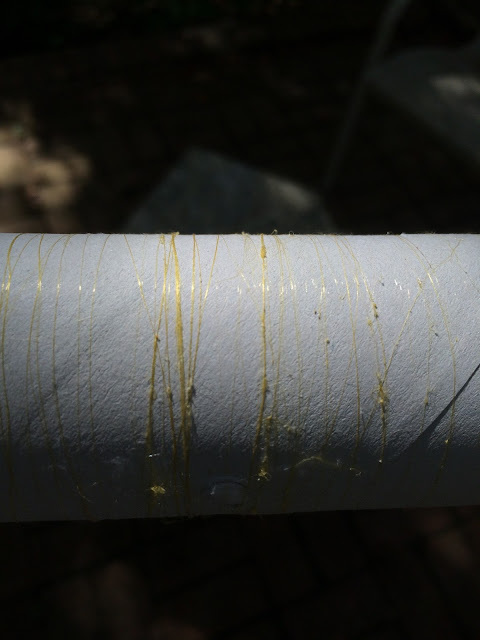 So I went inside and got a toilet paper roll and started winding the web onto the roll. 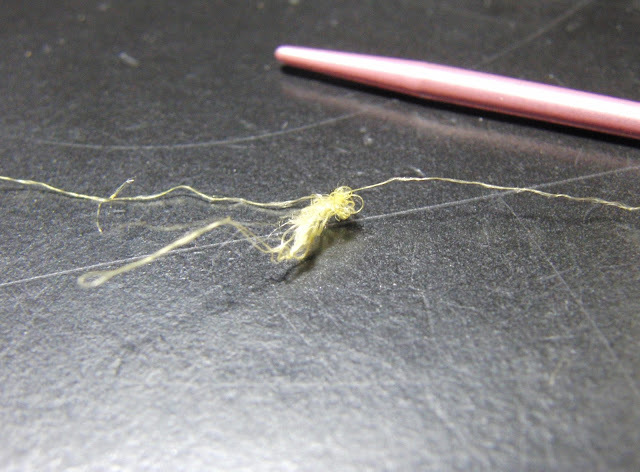 I combined several strands together with my fingers when possible, like spinning wool into yarn, but some of what I collected was single strand fibers. Then I went inside and got my smallest knitting needles, size 1 aluminum ones. I cast on with a single strand. It stuck tight to the needle and I couldn't move it. I peeled it off and rolled it into a ball and started again with Addi Lace nickel plated brass needles, the slickest needle I own. The smallest I had was a US size 4, 3.5 mm. I got a thick piece of fiber that I'd made from rolling together the middle of the web and I cast on 15 stitches. I knit a few rows on those needles. It worked pretty good. Then I tried some size 2 bamboo needles. Those were nice because they were so light. The silk tried to stick if I tried to push it along the needle with my finger, but if I tugged it along by grabbing the fabric underneath it was possible. 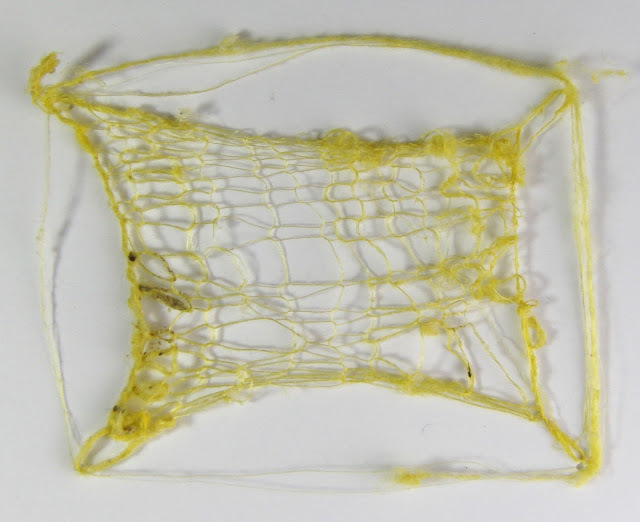 In conclusion, yes, I can knit spider silk. It is amazingly strong and fine and very hard to see. My LED Ott Light was key. Joining the fibers together is a dream. Just hold a new piece side by side with what is coming out of the work and roll it gently between your fingers. I doubled it back and forth on itself sometimes to try to make it big enough to see. I'm most proud of myself for seeing I'd dropped a stitch and then I was able to pick it up back up through three rows. Binding off was a disaster. I should have spun up some thicker fiber to do the bind off. I did a decrease bind off with a single strand and it just wadded up on me. It is very sticky. I stretched the final piece of fabric to 1" x 1.5" on a piece of foam core with pins. When I pulled out the pins it stayed there. This isn't really useful at all. If I am ever stranded on a desert island I will look for some wild cotton plants to spin together with spider silk to bulk it up before I try to knit myself new clothes. It does remind me of some yellow kevlar arm protectors I have. I wonder if they made the kevlar yellow on purpose to look like this spider silk?